Yesterday we returned home from Las Vegas where we attended SuperZoo. If you don’t know about SuperZoo, it is the largest pet retailer convention on the west coast. If you are a pet store owner, manufacturer, related to the pet industry in someway, well this is the place to be. Our first stop when all the festivities kicked off was stopping by and chatting with the wonderful folks of Petcurean. For the last 6 months we have had the pleasure of being blogger advocates for this incredible pet food company, which we have taken great honor in! 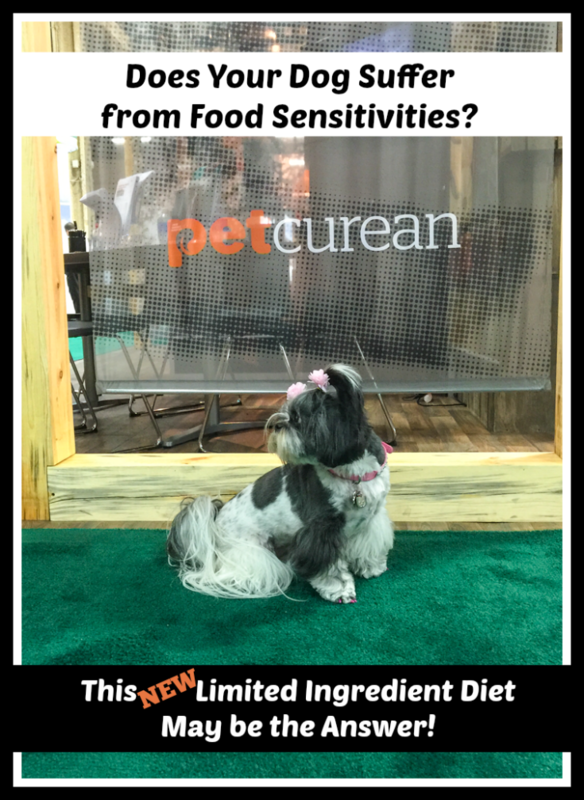 While we were at the Petcurean booth we discovered their wonderful new Limited Ingredient Diet for Dogs, all part of the Go! Sensitivity + Shine™ line. If you are you in search for a limited ingredient diet for your dog, this may be exactly what you are looking for! What is a Limited Ingredient Diet for Dogs? This week we are having a giveaway for a 25 pound bag of Petcurean Dog food, your choice of either the Go!™ or Now Fresh™! Just enter below! We bring our golden girl home on Saturday and have been researching all types of foods. We don’t know yet if she has any allergies but will definitely keep Petcurean in mind! I recently switched the boys to THK dehydrated formula and they too have a limited ingredient recipe. I like the simplicity of only a few ingredients especially with Harley’s sensitive tummy. Nice review. Rachel Sheppard recently posted…Rooney’s Birthday! My dog, Shyla, has allergies to beef and gets extremely ill. She is also sensitive to smoked flavoring and things with gravy. My dog is very sensitive to everything from food allergies to grass allergies. She’s so picky too, it’s hard to find something that she likes.